The Bachchans kept their Diwali celebrations strictly a family-only affair and spent the evening together. Highlights from the puja have been shared by Amitabh Bachchan and daughter-in-law Aishwarya Rai on their respective Instagram accounts and the pictures look fabulous. Aishwarya and her little daughter Aaradhya opted for silver lehengas for the Laxmi puja while Abhishek wore a grey-coloured kurta pyjama set. Amitabh and Jaya Bachchan complemented each other in golden. She wore a beautiful golden sari and he was pictured in a kurta pyjama set. 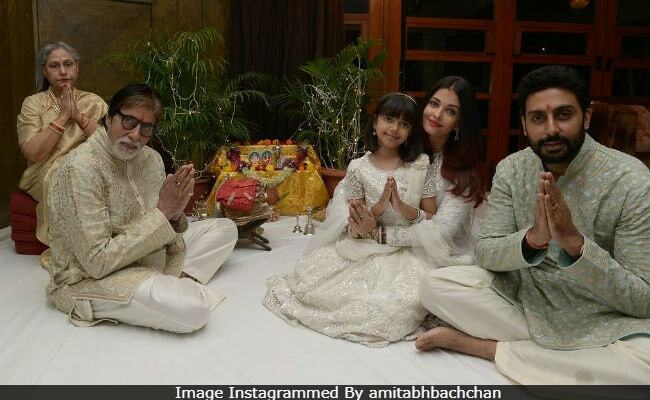 "Deepawali ki anek anek shubhkamanayein," Amitabh Bachchan, 76, captioned one of his posts, which is a picture of the entire family performing puja. In another post, they can be seen lighting sparklers. "Diwali brightness ever," wrote Big B. Inside Amitabh Bachchan's Diwali celebrations. Deepavali JI anek anek shubhkamanayein ..
Aishwarya shared these two pictures and wished everyone a very happy Diwali. How cute is Aaradhya? Wishing you all a very happy and prosperous Diwali! The day is special for Amitabh Bachchan as his much-awaited film Thugs Of Hindostan hits the screens on Thursday. In Thugs Of Hindostan, Big B co-stars with Aamir Khan, Katrina Kaif and Fatima Sana Shaikh. For the very first time, Amitabh Bachchan and Aamir Khan have collaborated for a film. Thugs Of Hindostan is directed by Vijay Krishna Acharya. After Thugs Of Hindostan, Amitabh Bachchan will be seen in Brahmastra, which releases next year. Meanwhile, on the work front, Abhishek and Aishwarya have reportedly signed up for a film with Anurag Kashyap, tentatively titled Gulab Jamun. Abhishek is currently shooting for a film with Anurag Basu.